We dock for our first stop in the city of Regensburg, right after lunch. 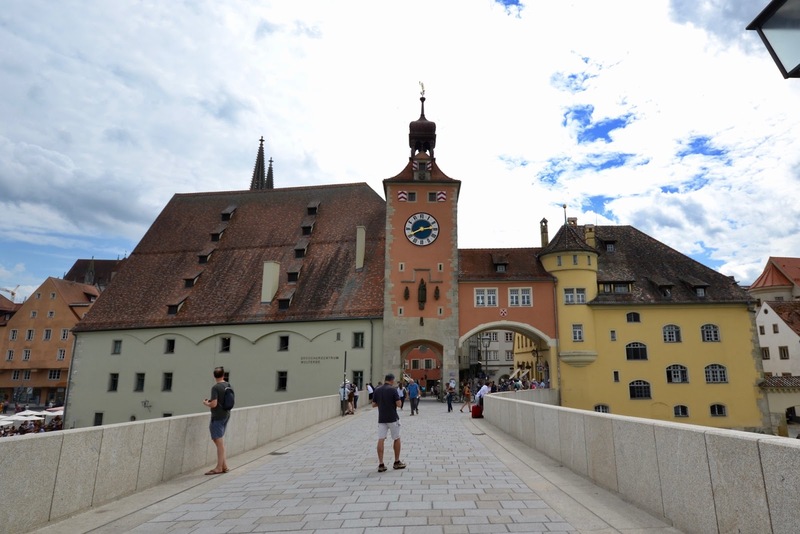 The centre of Regensburg is truly medieval – a UNESCO World Heritage Site. Spared the bombing visited upon Nuremberg, it hasn’t been seriously damaged since Napoleon visited. At almost 1,000 years old, its Stone Bridge is one of the oldest surviving crossings over the Danube. It’s our first chance to use our ‘receivers’ or headsets. The cruise has arranged local tour guides at each stop and you get to choose whether you want slow and leisurely, or a high paced tour. Every person on board is issued with a wireless receiver and you pair it with your guide. There are seven guides with number 7 as the slowest: we pick one in the middle. So, we take a moderate walk along the riverbank to the bridge. I stand at its centre and look west, trying to imagine the sounds, the smells, and the hopes of the Third Crusade, as the knights pass across this very bridge, off to combat Saladin’s forces in the Holy Land. Despite many gains, Richard the Lionheart’s armies don’t capture Jerusalem, and thus they will fail. Beside the bridge is the imposing Salt Barn (Salzstadel), a reminder of the importance of this mineral in the middle ages, and of Regensburg’s status. The Salt Barn is now a museum that traces the history of the city from Roman times. Alongside the museum is a building constructed for the workers that built the bridge; job done it became a restaurant, and it has operated continuously ever since, perhaps the oldest restaurant in the world. Most recently (the last 200 years), it has been the Wurstküche or Sausage Kitchen and, as anyone who knows me knows, I love sausages. 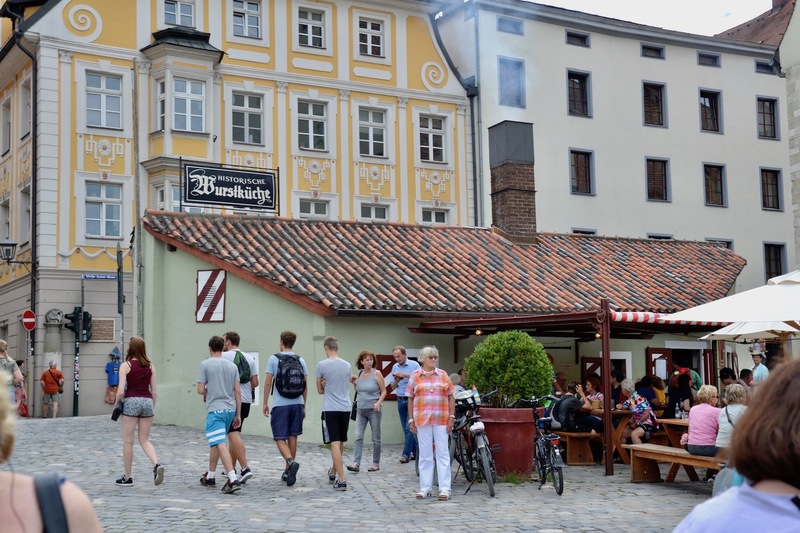 This place serves 6,000 sausages a day but, I’m reminded that we’ve just had lunch, and there’s a big-line up; worse still, our moderately-paced tour is moving on… …rats! 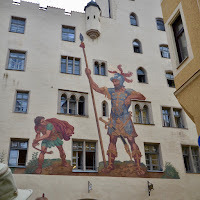 We walk into the town and facing us is a giant vibrant wall painting; this is David and Goliath, on the wall of the Goliath House (Goliathhaus). 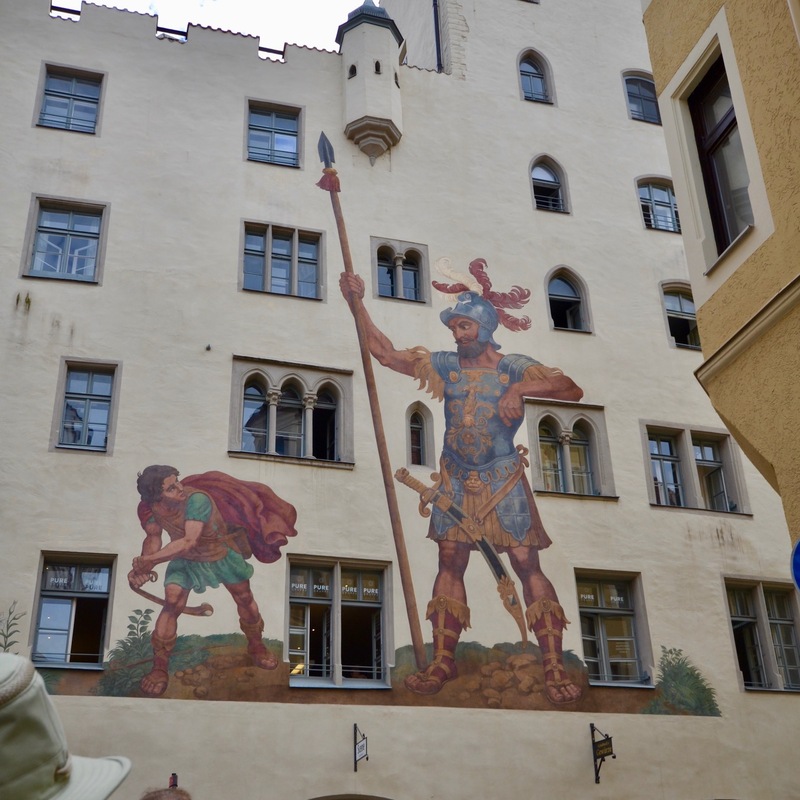 The house was built in 1260, with the painting added in 1573, and it’s been a landmark ever since. Just around the corner, our guide stops to point to a house where Oskar Schindler lived after WWII. Penniless, he was offered a room here for a couple of years. 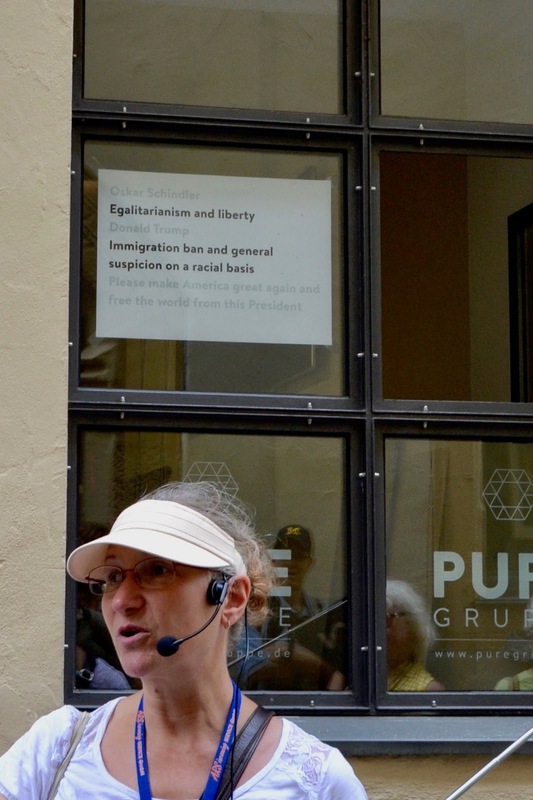 In the window, a sign makes a scathing comparison between Schindler and Trump. A young American couple expresses whispered outrage at the attack on their leader, but others just smile. I sense it will be a discussion in the bar tonight. We finish the formal phase of our tour at the Dom of St Peter’s with its ornate gothic exterior and we turn off our receivers. Controversially, this Catholic Cathedral bears a medieval anti-Semitic carving high on the outside wall called a ‘Jew’s sow’ showing three Jews suckling on a pig, facing the old Jewish district. Apparently, these were common in the middle ages. 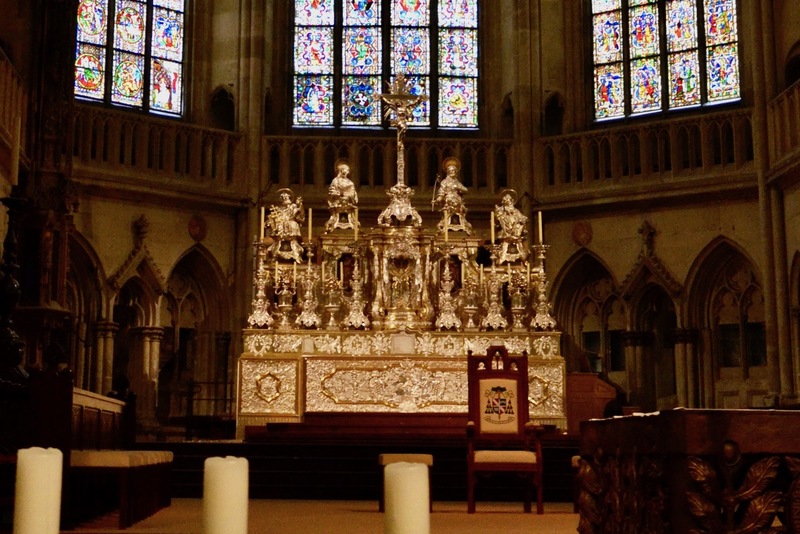 The interior is resplendent with 13th Century stained-glass windows and a silver high altar. Carol lights a votive candle for a friend at the shrine, beneath a relief of the Virgin and child. Back on board, it’s time to put our receivers on charge and relax with a cold beer – it’s been another >30°C day and the lager slides down easily. 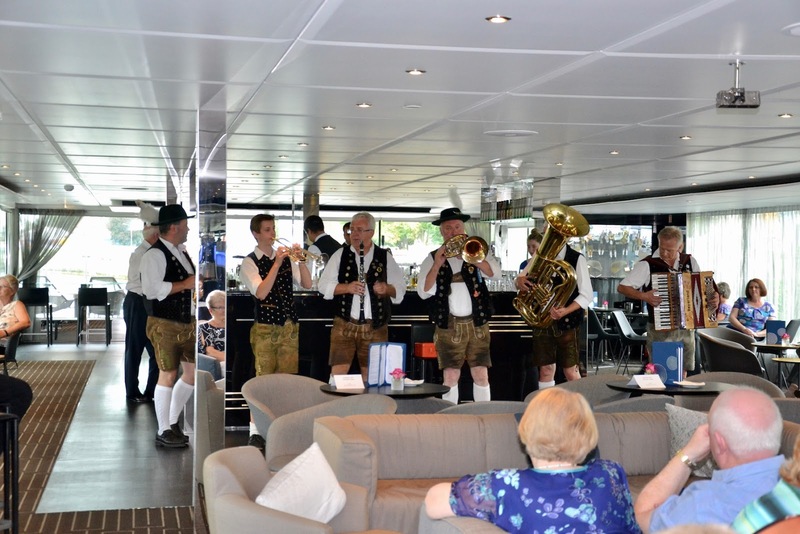 A local Bavarian ‘oompah’ Band arrives to entertain us, and tries to get us on our feet – nice try! Well, at least we didn’t have to wear lederhosen.